My good colleague David O’Connor has recently delved into the murky world of the EPO rule changes and has come up with some interesting findings. Form 1056A – this sets out an objection under new Rule 62a. It sets a two-month time limit (from the date of the form) in which to elect a single independent claim in each category (apparatus, method etc) for search. If no election is made the first independent claim in each category is searched. Beware: you will not be able to later limit the claims to unsearched subject-matter. Often seen: when US claim sets are filed without amendment. Form 1056B – this sets out an objection under new Rule 63. It sets a two-month time limit (from the date of the form) in which to indicate the subject-matter to be searched. 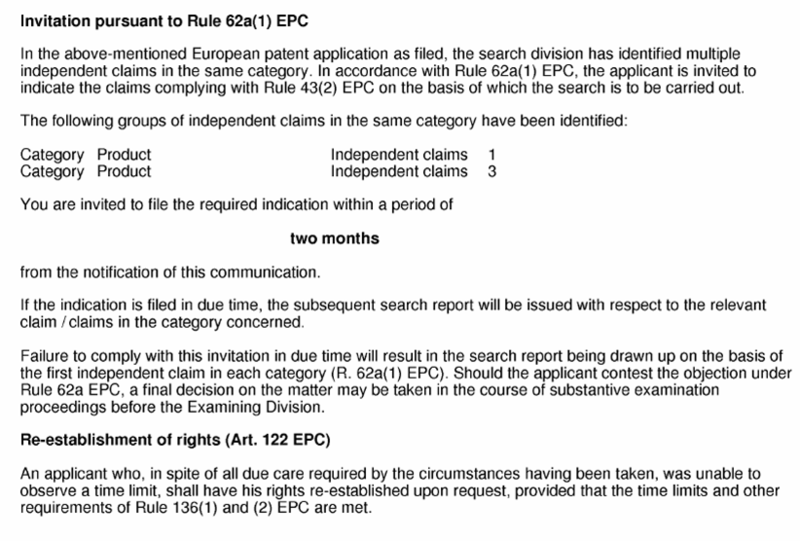 If no indication is made the European Patent Office (EPO) may only partially search your claims (or give-up and say no search could be performed). Often seen: when business method / software claims are filed, or following the filing of poor translations. Form 1056C – a rarer beast, a chimera of both objections. Found following, for example, the filing of a poor translation of a Japanese business method. The parasitic form 2906 may sometimes be found attached to any of the above, offering an explanation of the objections. A lack of unity objection can also be additionally raised. Beware there is no extension available. Further processing is ruled out. Form 1081 – issued when an examination fee is due 6 months after publication of the search report (R.70(1) EPC). Form 1082 – issued when the examination fee has been paid, the applicant must indicate whether they wish to proceed with examination (R.70(2) EPC). Form 1224 – same as form 1082 for ex-PCT applications, where a supplementary Search Report is drawn up by the EPO. Form 1083 – issued when the examination fee has been paid and the applicant has waived their right to indicate under R.70(2)EPC. This is a plainer specimen simply providing publication details. The addition of new rule 70a EPC spices things up a little. This rule requires a mandatory response to the Written Opinion of the Examiner that accompanied the Search Report. If a response is not filed the application is deemed to be withdrawn. The time limit is that set by R.70(1)/(2), which is now mostly six months. OFS/NFS – we believe these refer to Old Fee System and New Fee System, presumably indicating the fees that apply if any are due. RTB/non-RTB – through a process of Holmean deduction, it is pretty much assured this refers to the EPO’s beloved “Raising the Bar”, a phrase of almost political vacuity. Basically if you see “RTB” on a form it means the new rules apply; “non-RTB” means the old rules apply. ESOP01=Y/ESOP01=N – translates as European Search Opinion is positive (says “yay”) and European Search Opinion is Negative (says “nay”). Following a positive opinion one would assume that there are no deficiencies to address and thus that no response need be filed. Following a negative opinion there will be deficiencies to address and thus a response will be needed to avoid the application being deemed withdrawn.